Approximately 70 percent of all new cases of bladder cancer are classified as non-muscle invasive, also called superficial bladder cancer. The initial treatment for this stage of bladder cancer is surgical removal of the tumor through a cystoscope (called TURBT). This is often followed by adjuvant (additional) therapy, which reduces the chances of the cancer recurring. Of these, approximately 20 to 25 percent of initially non-muscle invasive cancers will progress to invasive types during the person's lifetime. Recurrence is frequent depending on the presence of several established risk factors: multiplicity, T dimension, prior recurrence. Depending to the risk category patients are directed to different adjuvant treatments. In low risk categories the standard is one shot treatment with chemotherapy without any maintenance therapy. In intermediate risk patients, adjuvant induction therapy and maintenance chemotherapy or immunotherapy for at least one year is recommended. In high risk patients adjuvant induction and maintenance immunotherapy until 3 years is considered the best strategy. In this review data on the different drugs used in this setting will be discussed. The remaining 30 percent of bladder cancers are muscle invasive, and generally require surgery to remove the bladder (cystectomy) and the surrounding organs. Bladder carcinoma (BC) is the most common malignancy of the urinary tract 1. The worldwide age standardised incidence rate is 9 per 100,000 for men and 2 per 100,000 for women (2008 data)1. In 2006, 104,400 incident cases of bladder cancer were diagnosed in Europe, of which 82,800 were found in men and 21,600 in women1. In 2008 BC was the eighth most common cause of cancer-specific mortality in Europe 2. It is a disease that peaks during the third age and urothelial histology is present in about 90% of the cases 3 , 4. The mortality is declining in the last fifteen years 5 possibly reflecting increased standard of care. Tobacco smoking is the most important risk factor for BC, accounting for ~50% of cases 6 , 7. Other risk factors include: occupational exposure to aromatic amine, polycyclic aromatic hydrocarbons, dyestuff printing and rubber manufacture, responsible for about 4% of bladder cancer cases 8, controversial is the role of inflammation and urinary tract infections while there are no doubt about the association between the Schistosomiasis, a chronic endemic cystitis based on recurrent infection with a parasitic trematode, and bladder cancer, particularly squamous cell carcinoma 9 as well as the role of hair dyes or coffee drinking habits 10 , 11 , 12. Increasing evidence suggests that genetic predisposition has a significant influence on bladder cancer incidence, especially via its impact on susceptibility to other risk factors. A recent meta-analysis showed the protective role of a diet rich in vegetables and fruits with a favourable relative risk of 0.7 and 0.8, respectively 13. BC is often diagnosed at an early stage; in the United States during the year 2003, 47% of bladder cancer new cases were stage 0, 22% stage I, 11% stage II, 5% stage III and 6% stage IV 14. Non-Muscle-Invasive-Bladder-Cancer (NMIBC) (pTa, pT1, carcinoma in situ) represents 75-85% of the new cases 15, with 70% pTa, 20% pT1, and 10% of carcinoma in situ (CIS) 16. A papillary tumour confined to the mucosa is classified as stage Ta according to the Tumour, Node, Metastasis (TNM) classification system. Tumours that have invaded the lamina propria are classified as stage T1 while flat, high-grade tumours that are confined to the mucosa are classified as CIS (Tis). Most NMIBC (60-70%) have a trend for recurrence after transurethral vescical and some are at high risk for progression to muscle invasion 17 so the NMIBC is a heterogeneous group of tumors with different biological properties. 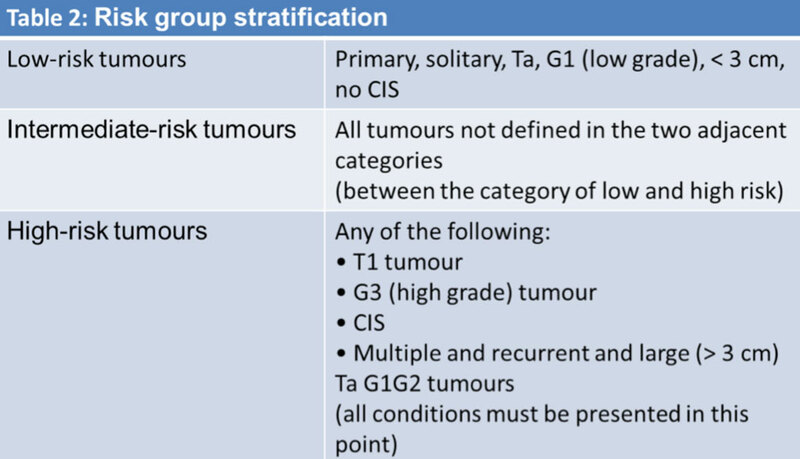 The classic way to categorise patients with Ta, T1 tumours with or without concomitant CIS is to divide them into risk groups based on prognostic factors derived from multivariate analyses. According to a metanalysis of 19 studies 18 in 2596 patients treated with different drugs and regimens 19 the most important risk factors for recurrence are the number of synchronous tumours previous NMIBC and tumour size. From these data it is possible to score patients in 3 groups (low, intermediate and high risk of recurrence); low risk group has a recurrence rate at 5 years of 31% while high recurrence group has a recurrence rate of 78%. Other authors, according to Fernandez-Gomez et al (CUETO Club Urologico Espanol de Tratamiento Oncologico) 20 , 21 categorize patients according to the presence of 4 risk factors (multiplicity, female gender, prior tumour, presence of carcinoma in situ). Progression to muscular invasive cancer is less frequent than recurrence: at 5 years, progression is reported up to 45% of the cases, depending on the different category risk groups 22. 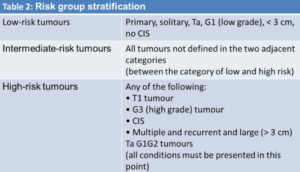 According to Sylvester et al 23, the most important risk factors for progression are T category, presence of concomitant CIS, tumor grade, resulting in a EORTC (European Organisation for Research and Treatment of Cancer) score that assigns NIMBC disease to three different progression risk categories (low, intermediate and high risk of progression). Moreover, Fernandez et al 24 found in a multivariate analysis that recurrence at first cystoscopy, stage, grade, and an history of recurrent disease are the most important progression prognostic factors: in this analysis the presence of concomitant CIS at first diagnosis was statistically significant only at univariate analysis. The role of molecular markers has not been fully explored: according to some data expression of fibroblast growth factor receptor 3 (FGFR3) seems correlated to a favorable prognosis 25 , 26 , 27. Some novel parameters based on pathological investigation of resected tissue have been evaluated and considered for subclassification and prognostic purposes such as the depth and extent of invasion into the lamina propria (T1 substaging), the presence of lymphovascular invasion, detection of the micropapillary variant of urothelial carcinoma as a poor prognostic factor 28 , 29 , 30 , 31 (Table I). 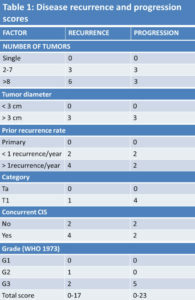 Based on available prognostic factors and particularly data from the EORTC risk tables, the assignment of patients to a specific risk category for recurrence or progression is considered crucial for facilitate treatment recommendations and the choice of the adequate adjuvant intravesical therapy (Table II). Trans uretral resection (TUR) represents the first step for diagnosis and treatment 32 , 33 , 34 , 35. It should be performed with complete excision of NMIBC until deep muscle. A single resection is acceptable for lesion less of 1 cm, while multiple treatments are needed for larger lesions. Residual tumor after resection of the T1 cases was found in 33-53% 36 , 37 , 38 , 39 , 40 , 41. The results of an EORTC phase 3 study, showing a wide range of recurrence rate in multifocal NMIBC among the several centers involved in the trial (7-46% at 3 months), suggest a difference in TUR effectiveness in the different institutions 42. In a recent study re-TUR was performed in 83 patients. Residual tumor was found in 53% of pT1 and in 27% of pTa NMIBC, often in the same site of the previous resection (81%) 43. In pT1 NMIBC the prognosis largely depends on the pathology at time of the second TUR. Re-TUR is considered important also to predict response to adjuvant treatment. In fact, according to Herr et al 44, there was a better response to BCG after a re-TUR than in patients that received only one TUR, probably due to a more radical surgery and accurate staging 45 , 46. A re-TUR is considered mandatory if the first TUR is incomplete, with the absence of muscle in the specimen, and in case of multiple, large, pT1, G3, high risk NMIBC12. Excluded from re-TUR are the patients with TaG1 at diagnosis and multiple recurrent TaG1. Re-TUR is recommended 2-6 weeks after the TUR and should include a resection in the site of previous tumor 47. Immediate radical cystectomy should always be considered for NMIBC high risk patients, including those with multiple recurrent high grade tumor, pT1 high grade tumor, high grade tumors with concomitant CIS, particularly after BCG failure. Some data suggest that deferred cistectomy may decrease disease-specific survival 48. Although state-of-the-art TUR by itself can eradicate a Ta, T1 tumour completely, these tumours commonly recur and can progress to MIBC. It is therefore necessary to consider adjuvant therapy in all patients according data from the EORTC risk tables (Table 2). In this section we review the clinical data available regarding the intra-vesical medical treatment of NMIBC. Data are based on a PUBMED search performed in February 2014. Several antineoplastic agents have been tested for the treatment of non-muscle-invasive UBC. Mitomycin C (MMC) is the most commonly used intravesical chemotherapy to date. Alternative agents are gemcitabine, doxorubicin, and epirubicin (not approved for clinical use in North America). MMC is a chemotherapeutic agent that acts through a mechanism of action not completely known, in part is an alkylating agent that inhibits the synthesis of DNA through the induction of cross internal links. Its high molecular weight (334 kDa) makes it ideal as an intravesical agent 49 , 50. Myelosuppression is rare (0.7%) 51 for its low systemic absorption. The chemical cystitis is the most frequent side effect and has been reported in 41% of cases 52. MMC was evaluated as monotherapy compared to TUR alone in numerous studies in various modes and setting of treatment (different risk groups, such as single instillation after TUR, as maintenance therapy). Moreover, MMC was tested at doses between 20 and 60 mg diluted in 0.9% saline solution and in a concentration of between 0.5 and 2 mg/ml 53. From the early 80’s MMC has been used in several phase I-II studies including low and high risk patients 54 , 55 , 56. In a metanalysis of 5 controlled studies and 859 patients treated with MMC it appears that MMC treatment induces an overall advantage of 15% in term of short term recurrence rate compared to TUR alone (37 vs. 52%), although at 5 years the recurrence rate was similar 57. A phase III randomized trial 58, 502 patients were randomized in 3 arms: no treatment after TUR, a single instillation (40 mg) within 24 hours post-TUR and an early instillation followed by four consecutive 40 mg instillations every three months. An initial reduction in recurrence rate was demonstrated in the third arm with an improvement in disease free interval, although after a 7-years follow up the advantage was not statistically significant compared to a single early instillation, indicating the ineffectiveness of maintenance therapy 59. However, the role of maintenance therapy is still debated with discordant data coming from several metanalisys and controlled trials. Nilsson et al 60 analyzed 1774 patients in 9 randomized trials, showing an absolute benefit of 16% in term of reduction in recurrence rate for maintenance therapy (38 vs. 54%), while Solsona et al 61 , 62, in two consecutive randomized EORTC trials, investigating the role of maintenance chemotherapy (MMC 30 mg, and doxorubicin 50 mg) for 6 months (short maintenance) or for 1 year (long maintenance), was not able to identify any advantage for the maintenance groups in term of recurrence rate reduction compared to an initial single early instillation made immediately (within 24 hours) after TUR. Combined data from Medical Research Council and EORTC, comparing intravesical maintenance chemotherapy to TUR alone, has underlined that chemotherapy was only effective in reducing the recurrence rate and not progression rate, but again these studies included patients with different risk categories 63. In a non recent prospective trial 131 low risk NMIBC patients were randomized to receive a single early instillation of 30 mg MMC or no therapy post-TUR. At a short term follow up of 24 months adjuvant treatment arm was able to prolong the recurrence-free interval, although at a longer follow-up of 48 months no statistical difference was observed 64. In a recent metanalysis conducted by Sylvester et al 65, with several controlled studies and 427 NMIBC patients treated with MMC, the authors conclude that MMC administrated within 24 hours after TUR reduces the recurrence rate compared to TUR alone (36.7 vs. 48.4%), confirmed in another study, although small, also in multifocal tumours 66. In the intermediate risk setting a randomized trial compared an early single MMC instillation with maintenance treatments with no statistically difference in term of reduction of recurrences 67. What about the timing of MMC administration after TUR? A very early administration of MMC, within 24 hours from TUR and even earlier within 6 hours or during TUR seems to correlate with a significant better effect on the reduction of early recurrences both in low and intermediate risk NMIBC 68 , 69. 131 low risk patients were randomized to receive a single immediate instillation MMC (30 mg) or TUR alone, at 1 year all patients were recurrence free, at 2 years of follow-up an advantage in favor of the immediate instillation was present, while no statistically significant difference was present at a longer follow-up 70. Absolute contraindication to an early instillation is represented by a real or suspected bladder perforation during TUR, while a relative contraindication is represented by a deep and wide resection during TUR with significant bleedin 71 , 72. What is the best way of administration? A randomized trial by Au and coworkers 7362, tested MMC instillation in specific conditions; the hypothesis was to improve MMC effectiveness by increasing the bladder concentration through the alkalinization with sodium bicarbonate of the urine and a decrease of the bladder flow through ultrasound controlled catheterization. In this study 230 patients were randomized to receive this experimental schedule at 40 mg dose versus a control arm with 20 mg weekly for 6 weeks. At a 5-years follow up the median time to recurrence was in favor of the experimental arm with alkaline urine (29.1 vs. 11.8 months) with an higher proportion of recurrence free patients (41 vs. 24.6%) 74. Another small study investigated the option of an intensive schedule of MMC instillation in 40 intermediate risk NMIBC patients that underwent 3-time per week administration for 2 consecutive weeks after TURV. Low local and systemic toxicity was found, with interesting results in term of recurrence free rate and median time to recurrence; prospective trials are needed to confirm these data 75. According to some authors MMC is considered potentially superior to the other chemotherapy agents in reducing recurrence rate. However, prospective trials directly comparing different chemotherapy agents are scanty in the literature. In conclusion, MMC is safe and seems effective in low and intermediate risk NMIBC patients being able to decrease the recurrence rate when given as an early instillation after TUR. Discordant data are available regarding the role of maintenance therapy (one to three years) versus shorter therapy (6 weeks or longer). Maintenance was found ineffective in reducing progression rate and it seems to confer only a small advantage in reducing recurrence rate. Some promising data have been presented about enhancing the efficacy of MMC using microwave-induced hyperthermia (Synergo) or electromotive drug administration (EMDA) in patients with high-risk tumours. The current evidence, however, is limited. The electromotive administration of MMC (EMDA) is a method to improve absorption of the drug through the interstitial cell layer. An electric current (about 15-30 mAmpere) is delivered in order to increase cell layer permeability. In vitro experiments have shown higher cell concentration of the drug compared to normal intravesical instillation 76 , 77. In a phase II study (28 multifocal pTa-1, G1-2 NMIBC patients) EMDA (MMC 40 mg in 20 min with 15 mA electricity) has been compared to weekly 40 mg MMC instillation for 8 weeks with an advantage in term of reduction of recurrence rate (60% vs. 33%) 78. Another small trial tested EMDA in 13 high risk (pT1G3 and Tis) BCG refractory patients. At 15 months follow up, 31% of patients were recurrence free 79. Similar results were achieved with EMDA (complete response rate at 3 and 6 months 53% and 58%, respectively) and BCG (56% and 64%), both with a statistically significant difference versus MMC passive diffusion (28%, p = 0.036 and 31%, p = 0.012). At a median follow-up of 82 months the authors reported no difference in term of recurrence-free interval (35 months for MMC EMDA, 26 months for BCG and 19.5 months for MMC passive), progression to invasive cancer, cancer specific and overall mortality between MMC electromotive administration and BCG. The authors reported also lower local toxicity of electromotive administration versus BCG 80. According to the hypothesis that BCG-induced inflammation and this increases MMC uptake, a prospective trial has been performed with this combination. Twohundred-twelve NMIBC pT1 patients were randomized to receive 6 weekly instillations of BCG 81 mg or 3 cycles of a sequential schedule (2 weeks BCG followed by an electromotive administration of MMC) with overall 9 instillations. Recurrence free patients after induction therapy underwent maintenance therapy for 10 months with the same schedule. At a median follow-up of 88 months the experimental arm showed an higher disease free interval (69 vs. 21 months, p = 0.001) and lower recurrence rate (41.9 vs. 57.9%, p = 0.001), with a further advantage in terms of reduction of progression (9.3 vs. 21.9%, p = 0.004), cancer specific mortality (5.6 vs. 16.2%, p = 0.011) and overall survival (21.5 vs. 32.4%, p = 0.453) 81. Electromotive administration of MMC has also been tested as neoadjuvant treatment for low risk NMIBC patients. One-hundred-sixty-seven NMIBC pTaG1-G2 patients were randomized in three arm: TUR alone, a single MMC (40 mg) instillation before TUR and a single electromotive administration (MMC 40 mg in 30 min at 20mA) before TUR. At a median follow up of 84.7 months the authors demonstrated a significant advantage for experimental arm in term of reduction of recurrence rate and of disease free interval 82. Anthracyclines, doxorubicin and its derivative epirubicin, are chemotherapic agents that inhibits Topoisomerase II. Their high molecular weight (580 kDa) reduces the systemic absorption and therefore the toxicity; doxorubicin seems to be more toxic than epirubicin due to the more frequent appearance of chemical cystitis (28.8%), allergic reactions (0.3%), gastrointestinal side effects (1.7%) and fever (0.8%) 83. Doxorubicin is used in a dose ranging from 30 to 100 mg with a weekly or three weekly schedule 84 with an overall reduction in tumor recurrence of 18% compared to untreated controls 85 , 86 , 87 , 88 , 89 , 90 , 91 , 92. Maintenance therapy (up to 2 years) was not superior to 6 weekly instillations of 50 mg doxorubicin in term of reduction of recurrences 93. Doxorubicin has not been found effective in reducing tumor progression 94. Reduction in recurrence rate with weekly or a single dose post-TUR doxorubicin instillation has been demonstrated in many prospective trials 95 , 96 , 97 , 98 , 99 , 100 , 101. In a phase I-II study in CIS G3 NMIBC patients, epirubicin (at escalating doses of 30, 50 and 80 mg) induced 70% of cases recurrence free, with a mean duration of complete remission of 22.4 months (range 7-50 months) 102. In a randomized trial the two anthracyclines have been compared in 114 patients treated over a 1-year period. At the 1 and 2 year follow up there was no statistically difference in term of tumor-free rate 103. Another trial compared the effectiveness of the two anthracyclines randomized 253 patients in 4 arms: epirubicin 50 mg, epirubicin 80 mg, doxorubicin 50 mg for 8 consecutive weeks, no treatment after TUR and monthly maintenance for 1 year. Recurrence rates were 25, 17.6, 36.7 and 65.6%, (p < 0.05 in favor of both doses of epirubicin) with a mean recurrence free interval of 16, 15.4, 18.9 and 6.3 months. Epirubicin induced a lower toxicity than doxorubicin even if utilized at the higher dose 104. The effectiveness of epirubicin has been shown also as an early (within 24 hours) single post TUR instillation. Epirubicin has been proposed as the standard treatment for low risk NMIBC and as a treatment option for intermediate and high risk NMIBC with a reduction of 39% in recurrence rate according to the main meta-analysis 105. However, data regarding the reduction in recurrence rate in intermediate risk NMIBC are scanty. In one study 106 an early single epirubicin 50 mg instillation within 6 hours from TUR was poorly effective in tumor larger than 5 mm. In another randomized multicenter trial in 219 low/intermediate risk NMIBC, an early single epirubicin 80 mg instillation post TUR versus TUR alone without no further adjuvant treatment induced a statistically significant reduction of recurrence. At a median follow-up of 3.9 years, 62% of patients in the epirubicin group versus 77% in the TUR alone arm had recurrence (p = 0.016). However, the advantage was described only in primary, solitary tumors, while the same benefit was not evident in patients with recurrent or multiple tumors (intermediate-high risk for recurrence) 107. Therefore, in intermediate/high risk NMIBC and in particular in large tumor, multiple recurrences and multiple primitive tumors, due to the small number of patients included in the studies, the role of an early single instillation of epirubicin is debated 108. A recent randomized trial compared three epirubicin schedules in 731 intermediate and high risk patients; patients were randomized to receive 4 consecutive weekly treatments followed by 5 monthly administration (standard schedule), the same treatment with in addition an early instillation within 48 hours, or a similar treatment as in the first arm with additional instillations at 9 and 12 months. At a follow-up of 5 years no difference has been recorded among the three groups in term of recurrence (44.4%, 42.7%, and 45.0% recurrence free, respectively) and progression rate (90.0%, 87.7%, and 88.2% progression free) 109. Few studies have directly compared the main chemotherapy agents. No phase III study has effectuated. A small non recent phase II trial utilized epirubicin and mitomycin C in all categories. Sixty patients were treated per arm and the two drug had similar effectiveness in term of remission rate. In conclusion, epirubicin is as effective and less toxic than doxorubicin, but actually its real clinical application is controversial and it seems limited to a single instillation post TUR or 6 weekly therapies only in low risk patients. Epirubicin maintenance therapy seems not effective. Further trials are needed to clarify its role in NMIBC management. Gemcitabine is an antimetabolite chemotherapy agent that causes cell apoptosis through its incorporation into RNA and DNA. Gemcitabine is widely used systemically in infiltrating bladder cancers as adjuvant treatment or for advanced disease. Safety of intravesical gemcitabine has been tested in many phase I studies showing that the maximum doses utilized (2000 mg total 40 mg/mL in a 50 mL volume) is effective with a favorable toxicity profile due to minimal systemic absorption. In phase I studies no grade 4 hematological toxicity was recorded while hematuria, dysuria, headache, fatigue 110, hand-foot syndrome 111, hypogastric discomfort and grade 1 bladder spasms were reported 112. A phase 2 multicenter study investigated the effectiveness, local and systemic tolerability of gemcitabine. One-hundred-sixteen intermediate and high risk NMIBC patients (refractory and not refractory to BCG) were treated with a gemcitabine 2000 mg weekly schedule for 6 weeks after TUR. 12 % of the patients reported urinary urgency, 5.1% dizziness and slight fever, 0.8% abdominal pain with ulcerative lesions at cystoscopy. At 1 years follow-up 74.6% of patients were disease free, while recurrences were observed in 25.4% of the cases, with a mean recurrence free time of 7 months. At univariate analysis the drug was more effective in NMIBC patients at first diagnosis (p = 0.04), in untreated cases (p = 0.03), and pTa patients (p = 0.0018). In BCG refractory patients the authors reported a complete response rate of 75% in intermediate risk NMIBC (24 patients) and of 43.7% in highrisk NMIBC (16 patients) 113. In another phase 2 study only in BCG-refractory NMIBC patients, 30 patients underwent a twice weekly gemcitabine (2000 mg) instillation for three consecutive weeks, for two times with a week of rest 114. Patients were evaluated at 8 weeks, then every 3 months for 1 year. At a median follow-up of 19 months, 50% of the patients were in complete response with a 1-year recurrence-free survival rate of 21%, while relapsed patients had a median recurrence free survival time of 3.6 months. Twenty-one% of the complete responders patients were recurrence free at 1 year with a time to recurrence of 19 months. Finally, 11 patients underwent to radical cystectomy 115. Shorter schedules of gemcitabine instillation were tested in Ta-T1 G1-2 (low or intermediate risk) NMIBC. Twenty-eight patients underwent 4 weekly instillations of 2000 mg gemcitabine. The complete response rate was 46.6% (absence of macroscopic residual lesion at cistoscopy after six weeks from the first instillation and negative urinary cytology). The median time to first recurrence was 9.1 months, with 32.2% of the patients recurrence free at 1 year 116. A chemo-immunotherapy combination showed interesting results in a preliminary prospective study. Fifty-nine percent of the patients were treated with 6 weeks BCG instillation while the remaining patients were treated with two gemcitabine instillations, the first immediately after TUR (1000 mg), and another a week later (2000 mg), followed by 6 weeks of BCG instillations. A median recurrence free period of 24 months was observed in the combination arm compared to 19 months in the BCG arm. At 6 and 9 months chemo-immunotherapy showed a lower recurrence rate, but no difference between the two arms was found at a longer follow up. These data suggest that gemcitabine-BCG combination is a promising strategy to prevent early relapse and to increase recurrence free period 117. More data are needed. Gemcitabine effectiveness in BCG refractory NMIBC has been investigated in several trial. In a randomized phase III trial gemcitabine (6 weekly instillations) was compared to MMC (4 weekly instillations), followed in both arms by 10 monthly instillations of maintenance therapy in responding patients. At a follow-up of 36 months, out of 109 evaluable patients 72% (39/54) in gemcitabine arm were recurrence-free versus 61% (33/55) in MMC group. MMC arm also showed an higher progression rate than gemcitabine in recurrent patientsand worse tolerability (higher chemical cystitis rate). According to these authors gemcitabine represents a preferable option in BCG-refractory NMIBC compared to MMC 118. In conclusion, gemcitabine is another intravesical chemoterapy agent with mild toxicity. It has been investigated in intermediate/high risk patients with interesting results. Gemcitabine seems to be more effective than MMC in BCG-refractory NMIBC. The interesting schedule with combined chemo-immunotherapy needs larger randomized trials. Intravesical immunotherapy is based on BCG (Bacillus-Calmette-Guerin) instillations after TUR. BCG is a modified strain of Mycobacterium Bovis that is able to induce an immunereaction after contact with bladder cells; the real anticancer mechanism is not yet well known. Different routes of BCG administration (percutaneus, intralesional injection, oral, intravesical and percutaneous combination) have been tested in several studies. Combined intravesical and percutaneus combination was to be not found superior to intravesical BCG alone in randomized studies 119 , 120 , 121 , 122. Local and systemic sides effects occur more frequently with intravesical BCG therapy than in patients treated with chemotherapy, as reviewed by Lamm 123, Witjes 124, Houghton 125. About 75% of patients treated experience chemical cystitis, haematuria and irritative voiding symptoms. Less frequently infections, as prostatitis and epididymo-orchitis, have been described with the need of BCG withdrawal. About 40% of patients suffers of systemic side effects as flu-like syndrome and fever and rarely sepsis. It is necessary to interrupt BCG administration in about 20% of cases. Most side effect appears during the induction therapy and in the first part of maintenance. According to several studies only one third of patients was able to complete the 36-months treatment. Absolute contraindications to BCG treatment are the occurrence of traumatic catheterization, TUR within previous two weeks (risk of systemic infection), macroscopic haematuria, urethral stenosis, prior BCG related sepsis, immunosuppression, urinary tract infection, active tuberculosis 126. Some trials have explored the reduction of the dose in patients intolerant to the full dose. In an initial study, 500 patients of all stages and grades were treated with a full BCG dose (81 mg) compared to one-third of the dose, for 12 instillations. The reduced dose showed a better toxicity profile, but it was not found equally effective in high risk patients compared to the full dose 127. This data were in contrast in accordance with those fonded in a smaller study in which similar effectiveness was found between 81 mg and 27 mg 128. Another trial in 430 intermediate risk patients compared 12 weekly BCG instillations at the dose of 27 mg, or 13.5 mg compared to 30 mg MMC. The lower dose was found not effective, while the 27 mg BCG dose was more toxic than MMC. BCG is derived from different strains and in some studies no difference was found among them in terms of effectiveness and toxicity 129 , 130 , 131. The hypothesis that early occurrence of local or systemic side effects leads to a longer time to first recurrence has not been confirmed in clinical trials 132. BCG is usually administrated 3-4 weeks after TUR as an induction therapy of 6 weeks followed by a maintenance period of 3 consecutive weeks every 3 or 6 months at variable duration from 1 to 3 years 133 , 134. BCG reduces recurrence rate versus TUR alone 135 , 136 and it is superior to chemotherapy according to the main metanalysis 137 , 138 , 139 , 140 . Data indicate that the maintenance period is needed to obtain an advantage of 32% versus MMC in terms of recurrence and progression risk. In the Sylvester’s meta-analysis116 with 4863 patients from more than 20 randomized trials with BCG, the reduction in progression rate has been observed only in the trials where maintenance treatment was given. At a median follow up of 2.5 years only 9.8% of the patients under BCG maintenance treatment progressed versus 13.8% in the control arms. Maintenance BCG treatment was found particularly effective in papillary intermediate-high risk NMIBC (only 6% progressed) and in patients with CIS (only 14% progressed) 141. BCG maintenance was found very effective in patients with CIS compared to MMC and other chemotherapic agents. In a recent meta-analysis with 700 CIS patients it has been underlined that BCG allows short and long term advantages compared to chemotherapy with a complete response rate of 68% versus 51% (p = 0.0002) 142. In these patients the recurrence rate was in favor of BCG compared to chemotherapy. At a median follow up of 3.6 years 47% of BCG maintenance patients were disease free versus 26% of those treated with chemotherapy. Furthermore, 40-60% of patients who failed after BCG induction treatment responded to a second BCG induction treatment 143. In conclusion, in intermediate risk NMIBC BCG maintenance treatment for one to three years has an higher activity compared to chemotherapy, particularly in pretreated and recurrent patients. In high risk patients, BCG maintenance treatment is able to prevent tumor relapse and progression in a significant proportion of patients. In the cases with carcinoma in situ, although BCG is effective, the option of radical cystectomy should always be taken into account 144. Although bladder carcinoma is often diagnosed at an early stage (NMIBC) there is an high rate of recurrences and progressions to invasive cancer. TUR is crucial for both diagnosis and management of NMIBC; it is needed to plan therapy according to grade, histology and deep muscle involvement 145 , 146 , 147 , 148 , 149. Adjuvant therapy is prescribed to reduce the recurrence rate (31-78% at 5 years) and progression risk (1-45% at 5 years). Re-TUR is strongly recommended in T1 NMIBC particularly when the resection has not reached the deep muscle. The type of intravesical adjuvant therapy should be based on the risk groups shown in Tables I, II, III, IV. One shot chemotherapy instillation within 6-24 hours after TUR is recommended in tumours presumed to be at low or intermediate risk. Early therapy is effective in reducing recurrence rate in low risk NMIBC patients, where no further treatment seems needed. In patients with intermediate-risk Ta T1 tumours, one immediate instillation of chemotherapy should be followed by 1 year maintenance immunotherapy or chemotherapy. In these patient chemotherapy was found effective in reducing the risk of recurrence but not the risk of progression instead of the immunotherapy. The real role of chemotherapy maintenance on progression is debated and data do not support this strategy. In patients with high-risk tumours, full-dose intravesical BCG for 1-3 years is indicated. In patients recurrent after BCG failure gemcitabine treatment seems more effective than MMC when a contraindication to cystectomy is present. The schedules of treatment with sequential chemo-immunotherapy and electro-modulated MMC seems very promising but need larger trials. A great need for improvements is still awaited for the treatment of patients with NMIBC. Apart from defining the best regimen with the available drugs, efforts to increase efficacy have included several promising attempts to introduce new agents to intravesical therapy, to combine them with established agents, or to modify current regimens. New urine molecular marker tests are under investigation for initial diagnosis, early detection of the recurrence and as predictive factor for response to intravesical therapy; NMP22, Immunocyt and Urovysion seems the more close to the clinical practice 150. Fluorescence-guided transurethral resection based on 5-aminolevulinic acid is a promising technique able to reduce the residual tumor tissue after TUR and possibly to determine a decrease in recurrence rate 151. Promising new drugs and schedules of adjuvant intravesical therapy are under investigation. Immune-chemotherapy and EMDA MMC combined with BCG are in an advanced phase of investigation; other newer combinations including BCG-Interferonα-2B, RAD001 Gemcitabine, BGC-Sunitinib are now tested in ongoing trials. Also a new derivative strains from bacillus tuberculosis, the EN3348 (Mycobacterial Cell Wall-DNA Complex), is compared to MMC in BCG failure setting in an ongoing clinical trial 152. Ferlay J, S.H., Bray F, Forman D, et al. GLOBOCAN 2008 v1.2, Cancer Incidence and Mortality Worldwide: IARC CancerBase No. 10 2010, International Agency for Research on Cancer: Lyon, France. Ferlay J, Autier P, Boniol M, Heanue M, Colombet M, Boyle P. Estimates of the cancer incidence and mortality in Europe in 2006. Ann Oncol 2007; 18: 581-592. Ferlay J, Randi G, La Vecchia C, Levi F, Negri E, Boyle P, La Vecchia C. Declining mortality from bladder cancer in Europe. BJU Int 2008; 101: 11-19. IARC monographs on the evaluation of the carcinogenic risks to humans. Tobacco Smoke and Involun Smoking, no. 83. Lyon: International Agency for Research on Cancer, 2004. D’Avanzo B, La Vecchia C, Negri E, Decarli A, Benichou J. Attributable risks for bladder cancer in northern Italy. Ann Epidemiol 1995; 5: 427-431. Silverman DT, Devesa SS, Moore LE, Rothman N. Bladder cancer. In Cancer Epidemiology and Prevention. Oxford: Oxford University press, 2006: 1101-1127. Pelucchi C, Bosetti C, Negri E, Malvezzi M, La Vecchia C. Mechanisms of disease: The epidemiology of bladder cancer. Nat Clin Pract Urol 2006; 3: 327-340. La Vecchia C, Tavani A. Coffee and cancer risk: an update. Eur J Cancer Prev 2007; 16: 385-389. Steinmaus CM, Nunez S, Smith AH. Diet and bladder cancer: a meta-analysis of six dietary variables. Am J Epidemiol 2000; 151: 693-702. Commission on Cancer/American Cancer Society. National Cancer Database (NCDB). Available from, http://www.facs.org/cancer/ncdb; 2006. Babjuk M, Oosterlinck W, Sylvester R, Kaasinen E, Böhle A, Palou-Redorta J; European Association of Urology (EAU). 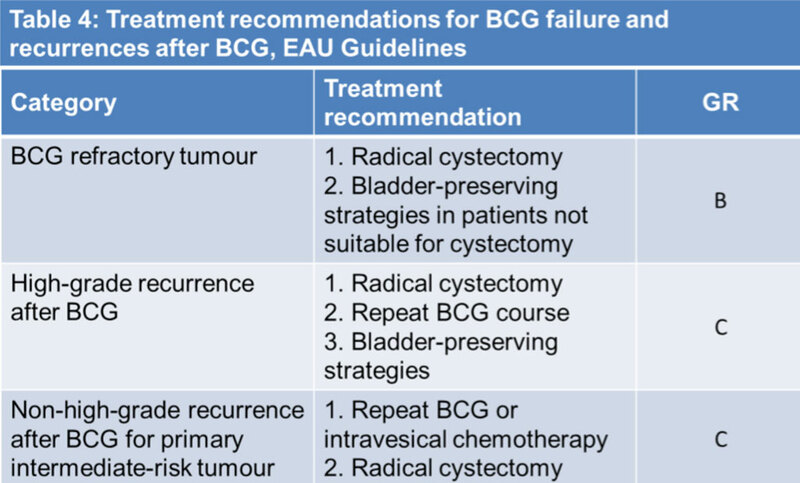 EAU guidelines on non-muscle-invasive urothelial carcinoma of the bladder. Eur Urol 2008; 54: 303-314. Lopez-Beltran A, Bassi P, Pavone-Macaluso M, Montironi R. Handling and pathology reporting of specimens with carcinoma of the urinary bladder, ureter, and renal pelvis. Eur Urol 2004; 45: 257-266. Amling CL. 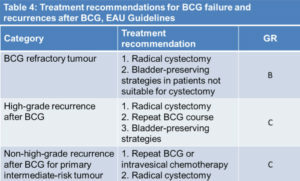 Diagnosis and management of superficial bladder cancer. Curr Probl Cancer 2001; 25: 219-278. Van Rhijn BW, Burger M, Lotan Y, Solsona E, Stief CG, Sylvester RJ, Witjes JA, Zlotta AR. Recurrence and progression of disease in non-muscle-invasive bladder cancer: from epidemiology to treatment strategy. Eur Urol 2009; 56: 430-442. Sylvester RJ. Natural history, recurrence and progression in superficial bladder cancer. Scientific World J 2006; 6: 2617 2625. Fernandez-Gomez J, Solsona E, Unda M, Martinezpiñeiro L, Gonzalez M, Hernandez R, Madero R, Ojea A, Pertusa C, Rodriguez-Molina J, Camacho JE, Isorna S, Rabadan M, Astobieta A, Montesinos M, Muntañola P, Gimeno A, Blas M, Martinez-Piñeiro Ja; Club Urológico Español de Tratamiento Oncológico (CUETO). Prognostic factors in patients with non muscle-invasive bladder cancer treated with bacillus Calmette-Guerin: multivariate analysis of data from four randomized CUETO trials. Eur Urol 2008; 53: 992-1001. Takaoka E, Matsui Y, Inoue T, Miyazaki J, Nakashima M, Kimura T, Oikawa T, Kawai K, Yoshimura K, Habuchi T, Ogawa O, Nishiyama H. Risk factors for intravesical recurrence in patients with high-grade t1 bladder cancer in the second TUR era. Jpn J Clin Oncol 2013; 43: 404-409. Burger M, Van Der Aa MNM, Van Oers JMM, Brinkmann A, Van Der Kwast TH, Steyerberg EC, Stoehr R, Kirkels WJ, Denzinger S, Wild PJ, Wieland WF, Hofstaedter F, Hartmann A, Zwarthoff EC. Prediction of progression of non-muscle invasive bladder cancer by WHO 1973 and 2004 grading and by FGFR3 mutation status: a prospective study. Eur Urol 2008; 54: 835 843. Hernandez S, Lopez-Knowles E , Lloreta J, Kogevinas M, Amorós A, Tardón A, Carrato A, Serra C, Malats N, Real FX. Prospective study of FGFR3 mutations as a prognostic factor in non-muscle invasive urothelial bladder carcinomas. J Clin Oncol 2006; 24: 3664-3671. Sedelaar JPM, Witjes JA. Technique of TUR of bladder tumours: value of repeat TUR and random biopsies. EAU-EBU Update Series 2007; 5: 139-144. Orsola A, Trias I, Raventós CX, Español I, Cecchini L, Búcar S, Salinas D, Orsola I. Initial high-grade T1 urothelial cell carcinoma: feasibility and prognostic significance of lamina propria invasion microstaging (T1a/b/c) in BCG-treated and BCG non-treated patients. Eur Urol 2005; 48(2): 231-238, discussion 238. Andius P, Johansson SL, Holmäng S. Prognostic factors in stage T1 bladder cancer: tumor pattern (solid or papillary) and vascular invasion more important than depth of invasion. Urology 2007; 70(4): 758-762. Cho KS, Seo HK, Joung JY, Park WS, Ro JY, Han KS, Chung J, Lee KH. Lymphovascular Invasion in Transurethral Resection Specimens as Predictor of Progression and Metastasis in Patients With Newly Diagnosed T1 Bladder Urothelial Cancer. J Urol 2009; 182(6): 2625-2631. Amin A, Epstein JI. Noninvasive micropapillary urothelial carcinoma: a clinicopathologic study of 18 cases. Hum Pathol 2012; 43(12): 2124-2128. Herr HW, Donat SM. Quality control in transurethral resection of bladder tumours. BJU Int 2008; 102: 1242-1246. Zlotta AR. When and how to treat superficial and muscle-invasive bladder cancer. Eur Urol 2007; 52: 1554-1557. Miladi M, Peyromaure M, Zerbib M, Saïghi D, Debré B. The value of a second transurethral resection in evaluating patients with bladder tumours. Eur Urol 2003; 43: 241-245. Brauers A, Buettner R, Jakse G. Second resection and prognosis of primary high risk superficialbladder cancer: is cystectomy often too early? J Urol 2001; 165: 808-810. Schips L, Augustin H, Zigeuner R-E, Gallé G, Habermann H, Trummer H, Pummer K, Hubmer G. Is repeated transurethral resection justified in patients with newly diagnosed superficial bladder cancer? Urology 2002; 59: 220-223. Grimm MO, Steinhoff C, Simon X, Spiegelhalder P, Ackermann R, Vogeli TA. Effect of routine repeat transurethral resection for superficial bladder cancer: a long-term observational study. J Urol 2003; 170: 433-437. Divrik RT, Yildirim Ü, Zorlu F, Ozen H. The effect of repeat transurethral resection on recurrence and progression rates in patients with T1 tumors of the bladder who received intravesical mitomycin: a prospective, randomized clinical trial. J Urol 2006; 175: 1641-1644. Jahnson S, Wiklund F, Duchek M, Mestad O, Rintala E, Hellsten S, Malmström PU. Results of second look resection after primary resection of T1 tumour of the urinary bladder. Scand J Urol Nephrol 2005; 39: 206-210. Brausi M, Collette L, Kurth K, Van Der Meijden AP, Oosterlinck W, Witjes JA, Newling D, Bouffioux C, Sylvester RJ; EORTC Genito-Urinary Tract Cancer Collaborative Group. 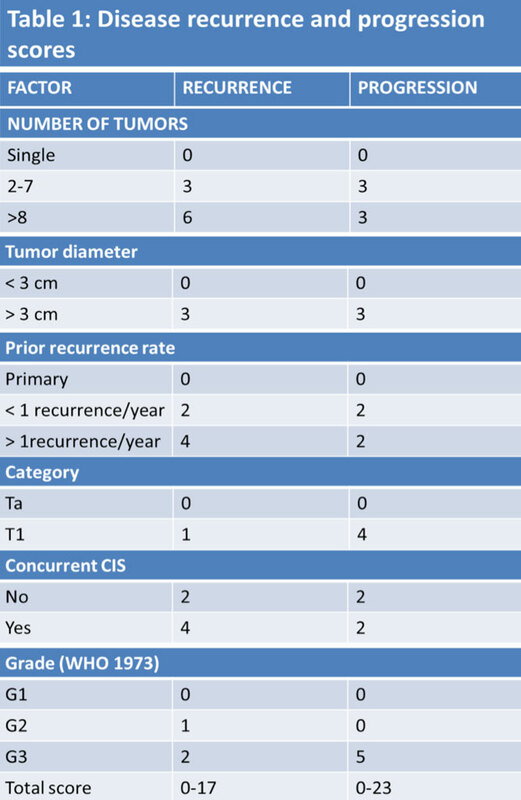 Variability in the recurrence rate at first follow-up cystoscopy after TUR in stage Ta T1 transitional cell carcinoma of the bladder: a combined analysis of seven EORTC studies. Eur Urol 2002; 41: 523-531. Grimm MO, Steinhoff CH, Simon X, Spiegelhalder P, Ackermann R, Vogeli TA. Effect of routine repeat transurethral resection for superficial bladder cancer: a long-term observational study. J Urol 2003; 170: 433-437. Herr HW, Donat SM, Dalbagni G. Can restaging transurethral resection of T1 bladder cancer select patients for immediate cystectomy? J Urol 2007; 177: 75-79. Herr HW. Restaging transurethral resection of high risk superficial bladder cancer improves the initial response to bacillus Calmette-Guerin therapy. J Urol 2005; 174: 2134-2137. Divrik RT, Yildirim U, Zorlu F, Ozen H. The effect of repeat transurethral resection on recurrence and progression rates in patients with T1 tumors of the bladder who received intravesical mitomycin: a prospective, randomized clinical trial. J Urol 2006; 175: 1641-1644. Raj GV, Herr H, Serio AM, Donat SM, Bochner BH, Vickers AJ, Dalbagni G. Treatment paradigm shift may improve survival of patients with high risk superficial bladder cancer. J Urol 2007, 177: 1283-1286. Bird VG, Soloway MS, Malmström P. Intravesical chemotherapy in the treatment of superficial bladder cancer. In: Droller MJ, ed. Bladder cancer, current diagnosis and treatment. Totowa, New Jersey: Humana Press 200; 183-223. Logan C, Brown M, Hayne D. Intravesical therapies for bladder cancer—indications and limitations. BJU Int 2012; 110 (Suppl 4): 12-21. Nielsen ME, Smith AB, Pruthi RS, Guzzo TJ, Amiel G, Shore N, Lotan Y. Reported use of intravesical therapy for non-muscle invasive bladder cancer (NMIBC): results from the Bladder Cancer Advocacy Network (BCAN) survey. BJU Int 2012; 110: 967-972. Thrasher JB, Crawford ED. Complications of intravesical chemotherapy. Urol Clin North Am 1992; 19: 529-539. Defuria MD, Bracken RB, Johnson DE, Soloway MS, Merrin CE, Morgan LR, Miller HC, Crooke ST. Phase I-II study of mitomycin C topical therapy for lowgrade, low stage transitional cell carcinoma of the bladder: an interim report. Cancer Treat Rep 1980; 64: 225-230. Macfarlane JR, Tolley DA. Intravesical mitomycin C therapy for superficial bladder cancer. Report of a multicentre phase II study. Br J Urol 1985; 57: 37-39. Villaronga A, Bellver E, Perli G, Pautaso O, Bengochea D, Roldán R-A, Podskubska O, Belén R, Delgado G, Laberti O, Lando R, Rey H, Bengio R, Minuzzi L, Goldman E, Milman A, Sanguinetti O, Wernert O. Mitomycin C for the treatment of superficial tumors of the bladder (Tis-Ta-T1) with one or more risk factors. Argentinian Cooperative Group of Oncourology (GCAO). Arch Esp Urol 1996; 49: 133-138. Lamm DL. Diagnosis and treatment of bladder cancer. Anticancer Drugs 1992; 3: 39-47. Tolley DA, Parmar MK, Grigor KM Lallemand G, Benyon LL, Fellows J, Freedman LS, Grigor KM, Hall RR, Hargreave TB, Munson K, Newling DW, Richards B, Robinson MR, Rose M-B, Smith PH, Williams JL, Whelan P. The effect of intravesical mitomycin C on recurrence of newly diagnosed superficial bladder cancer: a further report with 7 years of follow up. J Urol 1996; 155: 1233-1238. Nilsson S, Ragnhammar P, Glimelius B, Nygren P; Sbugroup. Swedish Council of Technology Assessment in Health Care. A systematic overview of chemotherapy effects in urothelial bladder cancer. Acta Oncol 2001; 40: 371-390. Bouffioux C, Kurth KH, Bono A, Oosterlinck W, Kruger CB, De Pauw M, Sylvester R. Intravesical adjuvant chemotherapy for superficial transitional cell bladder carcinoma: results of two European Organization for Research and Treatment of Cancer Genitourinary Group randomized trials with mitomycin C and doxorubicin comparing early versus delayed instillations and short term versus long-term treatment. European Organization for Research and Treatment of Cancer Genitourinary Group. J Urol 1995; 153: 934-941. Pawinski A, Sylvester R, Kurth KH, Bouffioux C, Van Der Meijden A, Parmar MK, Bijnens L. A combined analysis of European Organization for Research and Treatment of Cancer, and Medical Research Council randomized clinical trials for the prophylactic treatment of TaT1 bladder cancer. European Organization for Research and Treatment of Cancer Genitourinary Tract Cancer Cooperative Group and the Medical Research Council Working Part on Superficial Bladder Cancer. J Urol 1996; 156: 1934 1940. Solsona E, Iborra I, Ricós JV, Monrós JL, Casanova J, Dumont R. Effectiveness of a single immediate mitomycin C instillation in patients with low risk superficial bladder cancer: short and long term follow-up. J Urol 1999; 161: 1120-1123. Sylvester RJ, Oosterlinck W, Van Der Meijden AP. A single immediate post-operative instillation of chemotherapy decreases the risk of recurrence in patients with stage Ta T1 bladder cancer: a metaanalysis of published results of randomized clinical trials. J Urol 2004; 171: 2186-2190. Gudjonsson S, Adell L, Merdasa F, Olsson R, Larsson B, Davidsson T, Richthoff J, Hagberg G, Grabe M, Bendahl PO, Månsson W, Liedberg F. Should all patients with non-muscle-invasive bladder cancer receive early intravesical chemotherapy after transurethral resection? The results of a prospective randomised multicentre study. Eur Urol 2009; 55: 773-780. Islam MA, Bhuiyan ZH, Shameem IA. Intravesical adjuvant therapy using mitomycin C. Mymensingh Med J 2006; 15: 40-44. Mostafid AH, Rajkumar RGN, Stewart AB, Singh R. Immediate administration of intravesical mitomycin Cafter tumour resection for superficial bladder cancer. BJU Int 2006; 97: 509-512. Racioppi M, Porreca A, Foschi N, Delicato G, Destito A, D’Addessi A. Bladder perforation: a potential risk of early endovesical chemotherapy with mitomycin C. Urol Int 2005; 75: 373-375. Burks FN, Liu AB, Suh RS, Schuster TG, Bradford T, Moylan DA, Knapp PM, Murtagh DS, Dunn RL, Montie JE, Miller DC. Understanding the use of immediate intravesical chemotherapy for patients with bladder cancer. J Urol 2012; 188: 2108-2113. Bolenz C, Cao Y, Arancibia MF, Trojan L, Alken P, Michel MS. Intravesical mitomycin C for superficial transitional cell carcinoma. Expert Rev Anticancer Ther 2006; 6: 1273-1282. Okeke AA, Probert JL, Gillatt DA, Schwaibold H. Is intravesical chemotherapy for superficial bladder cancer still justified? BJU Int 2005; 96: 763-767. Au JL, Badalament A, Wientjes MG, Young DC, Warner JA, Venema PL, Pollifrone PL, Harbrecht JD, Chin JL, Lerner SP, Miles BJ; International Mitomycin C Consortium. Methods to improve efficacy of intravesical mitomycin C: results of a randomized phase III trial. J Natl Cancer Inst 2001; 93(8): 593-604. Di Stasi SM, Giannantoni A, Massoud R, Dolci S, Navarra P, Vespasiani G, Stephen RL. Electromotive versus passive diffusion of mitomycin C into human bladder wall: concentration-depth profiles studies. Cancer Res 1999; 59: 4912-4918. Brausi M, Campo B, Pizzocaro G, Rigatti P, Parma A, Mazza G, Vicini A, Stephen RL. Intravesical electromotive administration of drugs for treatment of superficial bladder cancer: a comparative Phase II study. Urology 1998; 51: 506-509. Sockett LJ, Borwell J, Symes A, Parker T, Montgomery BS, Barber NJ. Electro-motive drug administration (EMDA) of intravesical mitomycin-C in patients with high risk non invasive bladder cancer and failure of BCG immunotherapy. BJU Int 2008; 101 (Suppl 5): 50. Di Stasi SM, Giannantoni A, Stephen RL, Capelli G, Navarra P, Massoud R, Vespasiani G. Intravesical electromotive mitomycin C versus passive transport mitomycin C for high risk superficial bladder cancer: a prospective randomized study. J Urol 2003; 170: 777-782. Di Stasi SM, Giannantoni A, Giuroli A, Valenti M, Zampa G, Storti L, Attisani F, De Carolis A, Capelli G, Vespasiani G, Stephen RL. Sequantial BCG and electromotive mitomycin versus BCG alone for high-risk superficial bladder cancer: a randomized controlled trial. Lancet Oncol 2006; 7: 43-51. Di Stasi SM, Storti L, Giuroli A, Brausi M, Capelli G, Zampa G, Stephen RL. Single immediate preoperative instillation of electromotive mitomycin-C plus transurethral resection versus transurethral resection alone versus transurethral resection plus immediate mitomycin-C for pTa bladder tumors: long term results of prospective randomized trial. J Urol 2008; 179 (Suppl 4): 585 abs. 1707. Logan C, Brown M, Hayne D. Intravesical therapies for bladder cancer–indications and limitations. BJU Int 2012; 110 (Suppl 4): 12-21. Rubben H, Lutzeyer W, Fischer N, Deutz F, Lagrange W, Giani G. Natural history and treatment of low and high risk superficial bladder tumors. J Urol 1988; 139: 283-285. Kurth K, Tunn U, Ay R, Schroder FH , Pavone-Macaluso M, Debruyne F, Ten Kate F, De Pauw M, Sylvester R. Adjuvant chemotherapy for superficial transitional cell bladder carcinoma: long-term results of a European Organization for Research and Treatment of Cancer randomized trial comparing doxorubicin, ethoglucid and tranurethral resection alone. J Urol 1997; 158: 378-384. Ali-El-Dein B, El-Baz M, Aly AN, Shamaa S, Ashamallah A. Intravesical epirubicin versus doxorubicin for superficial bladder tumors (stages pTa and pT1): a randomized prospective study. J Urol 1997; 158: 68-73. Lamm DL. Long-term results of intravesical therapy for superficial bladder cancer. Urol Clin North Am 1992; 19: 573-580. Flamm J. Long-term versus short-term doxorubicin hydrochloride instillation after transurethral resection of superficial bladder cancer. Eur Urol 1990; 17: 119-124. Oosterlinck W, Kurth KH, Schröder F, Bultinck J, Hammond B, Sylvester R. A prospective European Organization for Research and Treatment of Cancer Genitourinary Group randomized trial comparing transurethral resection followed by a single intravesical instillation of epirubicin or water in single-stage Ta, T1 papillary carcinoma of the bladder. J Urol 1993; 149: 749-752. Melekos MD, Chionis HS, Paranychianakis GS, Dauaher HH. Intravesical 4´-epidoxorubicin (epirubicin) versus bacillus Calmette-Guérin: a controlled prospective study on the prophylaxis of superficial bladder cancer. Cancer 1993; 72: 1749-1755. Raitanen MP, Lukkarinen O. A controlled study of intravesical epirubicin with or without alpha 2b-interferon as prophylaxis for recurrent superficial transitional cell carcinoma of the bladder: Finnish Multicentre Study Group. Br J Urol 1995; 76: 697-701. Igawa M, Urakami S, Shirakawa H, Shiina H, Ishibe T, Kadena H, Usui T, Kawanishi M. Intravesical instillation of epirubicin: effect on tumor recurrence in patients with dysplastic epithelium after transurethral resection of superficial bladder tumour. Br J Urol 1996; 77: 358-362. Ali-El-Dein B, Nabeeh A, El-Baz M, Shamaa S, Ashamallah A. Single-dose versus multiple instillations of epirubicin as prophylaxis for recurrence after transurethral resection of pTa and pT1 transitional-cell bladder tumours: a prospective, randomized controlled study. Br J Urol 1997; 79: 731-735. Kurth K, Vijgh WJ, Ten Kate F, Bogdanowicz JF , Carpentier PJ, Van Reyswoud I. Phase 1-2 study of intravesical epirubicin in patients with carcinoma in situ of the bladder. J Urol 1991; 146: 1508-1512. Krege S, Giani G, Meyer R, Otto T, Rübben H. A randomized multicenter trial of adjuvant therapy in superficial bladder cancer: Transurethral resection only versus transurethral resection plus mitomycin C versus transurethral resection plus bacillus Calmette-Guérin. J Urol 1996; 156: 962-966. Berrum-Svennung I, Granfors T, Jahnson S, Boman H, Holmäng S. A single instillation of epirubicin after transurethral resection of bladder tumors prevents only small recurrences. J Urol 2008; 179: 101-105. Sylvester RJ, Oosterlinck W. An immediate instillation after transurethral resection of bladder tumor in nonmuscle-invasive bladder cancer: has the evidence changed? Eur Urol 2009; 56: 43-45. Hendricksen K, Witjes W-P, Idema JG, Kums JJ, Van Vierssen Trip OB, De Bruin MJ, Vergunst H, Caris CT, Janzing-Pastors MH, Witjes JA. Comparison of three schedules of intravesical epirubicin in patients with non-muscle-invasive bladder cancer. Eur Urol 2008; 53: 984-991. Dalbagni G, Russo P, Sheinfeld J, Mazumdar M, Tong W, Rabbani F, Donat MS, Herr HW, Sogani P, Depalma D, Bajorin D. Phase I trial of intravesical gemcitabine in bacillus Calmette-Guérin-refractory transitional-cell carcinoma of the bladder. J Clin Oncol 2002; 20: 3193-3198. Bartoletti R, Cai T, Gacci M, Giubilei G, Viggiani F, Santelli G, Repetti F, Nerozzi S, Ghezzi P, Sisani M; TUR (TOSCANA UROLOGIA) GROUP. Intravesical gemcitabine therapy for superficial transitional cell carcinoma: results of a Phase II prospective multicenter study. Urology 2005; 66: 726-731. Dalbagni G, Russo P, Bochner B , Ben-Porat L, Sheinfeld J, Sogani P, Donat MS, Herr HW, Bajorin D. Phase II trial of intravesical gemcitabine in bacille Calmette-Guérin-refractory transitional cell carcinoma of the bladder. J Clin Oncol 2006; 24: 2729-2734. Maffezzini M, Campodonico F, Canepa G, Capponi G, Fontana V. Short-schedule intravesical gemcitabin with ablative intent in recurrent Ta-T1, G1-G2, low- or intermediate-risk, transitional cell carcinoma of the bladder. Eur Urol 2007; 51: 956-961. Cho DY, Bae JH, Moon DG, Cheon J, Lee JG, Kim JJ, Yoon DK, Park HS. The effects of intravesical chemoimmunotherapy with gemcitabine and Bacillus Calmette-Guérin in superficial bladder cancer: a preliminary study. J Int Med Res 2009; 37: 1823 1830. Addeo R, Caraglia M, Del Prete S, Abbruzzese A, Vincenzi B, Montella L, Miragliuolo A, Guarrasi R, Lanna M, Cennamo G, Faiola V, Del Prete S. Randomized phase III trial on gemcitabine versus mytomicin in recurrent superficial bladder cancer: evaluation of efficacy and tolerance. J Clin Oncol 2010; 28: 543-548. Lightfoot AJ, Breyer BN, Rosevear HM, Erickson BA, Konety BR, O’donnell MA. Multi-institutional analysis of sequential intravesical gemcitabine and mitomycin C chemotherapy for non-muscle invasive bladder cancer. Urol Oncol 2013 Mar 16. pii: S1078-1439(13)00045-8. Barlow LJ, Benson MC. Experience with newer intravesical chemotherapy for high-risk non-muscle-invasive bladder cancer. Curr Urol Rep 2013; 14: 65-70. Luftnegger W, Ackermann DK, Futterlieb A, Kraft R, Minder CE, Nadelhaft P, Studer UE. Intravesical versus intravesical plus intradermal bacillus Calmette-Guérin: a prospective randomized study in patients with recurrent superficial bladder tumors. J Urol 1996; 155: 483-487. Lamm DL, Van Der Meijden PM, Morales A, Brosman SA, Catalona WJ, Herr HW, Soloway MS, Steg A, Debruyne FM. Incidence and treatment of complications of bacillus Calmette-Guérin intravesical therapy in superficial bladder cancer. J Urol 1992; 147: 596-600. Gontero P, Bohle A, Malmstrom PU, O’donnell MA, Oderda M, Sylvester R, Witjes F. The role of bacillus Calmette-Guérin in the treatment of non muscleinvasive bladder cancer. Eur Urol 2010; 57: 410-429. Witjes JA, Palou J, Soloway M, Lamm D, Brausi M, Speromon JR, Persad R, Buckley R, Axaza H, Colombel M, Böhle A. Clinical practice recommendations for the prevention and management of intravesical therapy associated adverse events. Eur Urol Suppl 2008; 7: 667-674. Sylvester RJ. Bacillus Calmette-Guérin treatment of non-muscle invasive bladder cancer. International Journal of Urology 2011; 18: 113-120. Houghton BB, Chalasani V, Hayne D, Grimison P, Brown CS, Patel MI, Davis ID, Stockler MR. Intravesical chemotherapy plus bacille Calmette-Guérin in non-muscle invasive bladder cancer: a systematic review with meta-analysis. BJU Int 2013; 111: 977-983. Martínez-Piñeiro JA, Martínez-Piñeiro L, Solsona E, Rodríguez RH, Gómez JM, Martín MG, Molina JR, Collado AG, Flores N, Isorna S, Pertusa C, Rabadán M, Astobieta A, Camacho JE, Arribas S, Madero R; Club Urológico Español de Tratamiento Oncológico (CUETO). Has a 3 fold decreased dose of bacillus Calmette-Guérin the same efficacy against recurrences and progression of T1G3 and Tis bladder tumors than the standard dose? Results of a prospective randomized trial. J Urol 2005; 174: 1242-1247.). Anti-tubercolar concurrent antibiotic treatment should not be prescribed since it can reduces BCG effectiveness. Ofloxacin and isoniazid have been proposed as prophylactic administration to reduce side effects. In a double blind trial versus placebo, 115 patients were treated with ofloxacin, a fluoroquinolone, that was found to be particular effective in reducing the moderate and severe adverse events ((Herr HW, Dalbagni G. Intravesical bacille Calmette-Guérin (BCG) in immunologically compromised patients with bladder cancer. BJU Int 2013; 111: 984-987. Herr HW, Dalbagni G. Intravesical bacille Calmette-Guérin (BCG) in immunologically compromised patients with bladder cancer. BJU Int 2013; 111: 984-987. Fellows GJ, Parmar MK, Grigor KM, Hall RR, Heal MR, Wallace DM. Marker tumor response to Evans and Pasteur bacilli Calmette-Guérin in multiple recurrent pTa/pT1 bladder tumors: report from the Medical Research Council Subgroup on Superficial Bladder Cancer (Urological Cancer Working Party). Br J Urol 1994; 73: 639-644. Vegt PD, Witjes JA, Witjes WP, Doesburg WH, Debruyne FM, Van Der Meijden AP. A randomized study of intravesical mitomycin C, bacillus Calmette-Guérin Tice and bacillus Calmette-Guérin RIVM treatment in pTa-pT1 papillary carcinoma and carcinoma in situ of the bladder. J Urol 1995; 153: 929-933. Sylvester RJ, Van Der Meijden AP, Oosterlinck W, Hoeltl W, Bono AV; EORTC Genito-Urinary Tract Cancer Group. The side effects of bacillus Calmette-Guérin in the treatment of TaT1 bladder cancer do not predict its efficacy: results from a European Organization for Research and Treatment of Cancer Genito-Urinary Group phase III trial. Eur Urol 2003; 44: 423-428. Lamm DL, Blumenstein BA, Crissman JD, Montie JE, Gottesman JE, Lowe BA, Sarosdy MF, Bohl RD, Grossman HB, Beck TM, Leimert JT, Crawford ED. Maintenance bacillus Calmette-Guérin immunotherapy for recurrent Ta, T1 and carcinoma in situ transitional cell carcinoma of the bladder; a randomized Southwest Oncology Group study. J Urol 2000; 163: 1124-1129. Sylvester RJ, Brausi MA, Kirkels WJ, Hoeltl W, Calais DA Silva F, Powell PH, Prescott S, Kirkali Z, Van De Beek C, Gorlia T, De Reijke TM; EORTC Genito-Urinary Tract Cancer Group. Long-term efficacy results of EORTC Genito-Urinary Group randomized phase 3 study 30911 comparing intravesical instillations of epirubicin, bacillus Calmette-Guérin, and bacillus Calmette-Guérin plus isonizid in patients with intermediate and high risk stage Ta T1 urothelial carcinoma of the bladder. Eur Urol 2010; 57: 766-773. Shelley MD, Kynaston H, Court J, Wilt TJ, Coles B, Burgon K, Mason MD. A systematic review of intravesical bacillus Calmette-Guérin plus transurethral resection vs transurethral resection alone in Ta and T1 bladder cancer. BJU Int 2001; 88: 209-216. Han RF, Pan JG. Can intravesical bacillus Calmette-Guérin reduce recurrence in patients with superficial bladder cancer? A meta-analysis of randomized trials.Urol 2006; 67: 1216-1223. Shelley MD, Wilt TJ, Court J, Coles B, Kynaston H, Mason MD. Intravesical bacillus Calmette-Guérin is superior to mitomycin C in reducing tumour recurrence in high-risk superficial bladder cancer: a metanalysis of randomized trials. BJU Int 2004; 93: 485-490. Bohle A, Jocham D, Bock PR. Intravesical bacillus Calmette-Guérin versus mitomycin C for superficial bladder cancer: a formal meta-analysis of comparative studies on recurrence and toxicity. J Urol 2003; 169: 90-95. Sylvester RJ, Van Der Meijden APM, Wijjes JA, Kurth K. Bacillus Calmette-Guérin versus chemotherapy for the intravesical treatment of patients with carcinoma in situ of the bladder: a meta-analysis of the published results of randomized clinical trials. J Urol 2005; 174: 86-92. Malmstrom PU, Sylvester RJ, Crawford DE, Friedrich M, Krege S, Rintala E, Solsona E, Di Stasi SM, Witjes JA. An individual patient data meta-analysis of the long-term outcome of randomized studies comparing intravesical mitomycin C versus bacillus Calmette-Guérin for non muscle invasive bladder cancer. Eur Urol 2009; 56: 247-256. Sylvester RJ, Van Der Meijden AP, Lamm DL. Intravesical bacillus Calmette-Guérin reduces the risk of progression in patients with superficial bladder cancer: a meta-analysis of the published results of randomized clinical trials. J Urol 2002; 168: 1964-1970. Sylvester RJ, Van Der Meijden A, Witjes JA, Jakse G, Nonomura N, Cheng C, Torres A, Watson R, Kurth KH. High grade Ta urothelial carcinoma and carcinoma in situ of the bladder.Urology 2005; 66 (Suppl 1): 90-107. Mowatt G, Zhu S, Kilonzo M, Boachie C, Fraser C, Griffiths T-R, N’dow J, Nabi G, Cook J, Vale L. Systematic review of the clinical effectiveness and cost effectiveness of photodynamic diagnosis and urine biomarkers (FISH, ImmunoCyt, NMP22) and cytology for the detection and follow-up of bladder cancer. Health Technol Assess 2010; 14: 1-331, iii-iv. Hajdinjak T. UroVysion FISH test for detecting urothelial cancers: Meta-analysis of diagnostic accuracy and comparison with urinary cytology testing. Urol Oncol 2008; 26: 645-651. Hermann GG, Mogensen K, Carlsson S, Marcussen N, Duun S. Fluorescence-guided transurethral resection of bladder tumours reduces bladder tumour recurrence due to less residual tumour tissue in Ta-T1 patients: a randomized two-centre study. BJU Int 2011; 108(8 Pt 2): E297-303. Stenzl A, Penkoff H, Dajc-Sommerer E, Zumbraegel A, Hoeltl L, Scholz M, Riedl C, Bugelnig J, Hobisch A, Burger M, Mikuz G, Pichlmeier U. Detection and clinical outcome of urinary bladder cancer with 5-aminolevulinic acid-induced fluorescence cystoscopy: a multicenter randomized, double-blind, placebo-controlled trial. Cancer 2011; 117: 938-947. 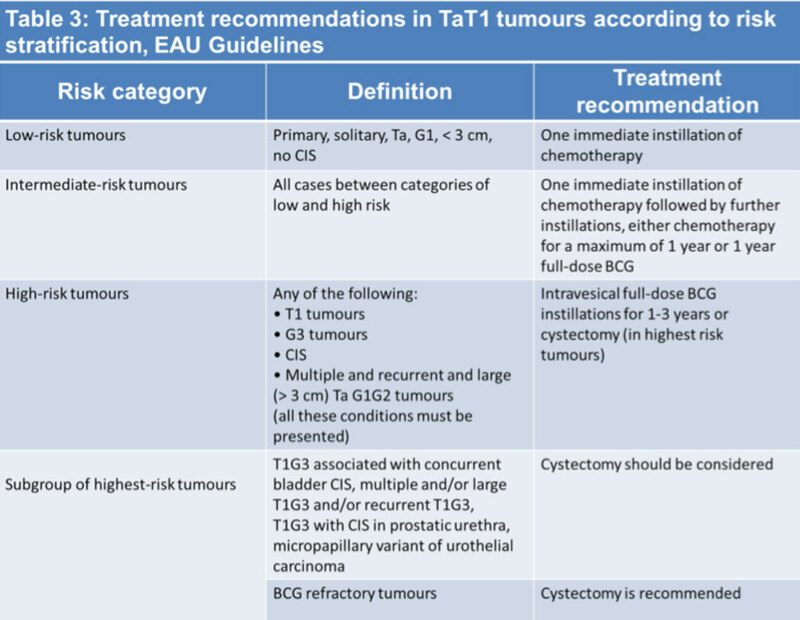 Babjuk M, Oosterlinck W, Sylvester R, Kaasinen E, Böhle A, Palou-Redorta J, Rouprêt M; EAU guidelines on non muscle-invasive urothelial carcinoma of the bladder, the 2011 update. European Association of Urology (EAU). Eur Urol 2011; 59: 997-1008.